NEW YORK--(BUSINESS WIRE)-- STORY, the narrative-driven retail concept shop, will bring to life an editorial approach to retail in 36 Macy’s (NYSE:M) stores nationwide. 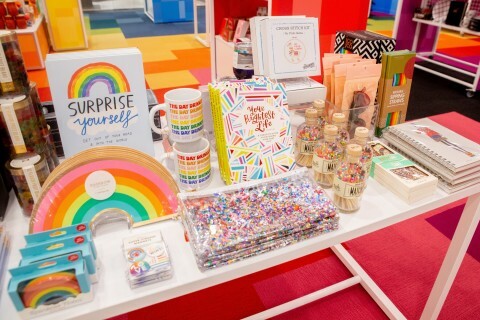 Opening with “Color” as its inaugural theme, STORY at Macy’s invites customers across the country to explore and experience color through a rainbow of curated, giftable products and through a range of more than 300 fun color-inspired events. In the lead up to launch, more than 270 dedicated STORY Managers and STORYtellers were hired and participated in “Know + Tell,” a new experiential retail training program that immerses staff with integrated roles on everything from building fixtures to customer engagement and event production. To bring the Color theme to the forefront, the team assembled a creative collective of industry leaders to design an unforgettable in-store experience. Award-winning NYC designer David Stark was given a blank canvas to envision a way to introduce the STORY brand at scale through a vibrant experience. Longtime STORY partner FLOR enlivens the space with a custom pixelated patterned carpet, creating an organizing principle to help navigate guests across a spectrum of color and cross-category merchandise. And to provide a versatile and easily adaptable canvas for its merchandise assortment, STORY leaned on its partnership with Italian fixture company ALU, which customized one of its signature fixture systems to serve STORY at Macy’s ever-changing model while offering a fresh look for the Macy’s shopper. “The STORY at Macy’s experience feels a lot like a real life version of scrolling through Instagram. You discover things you weren’t looking for, but are inspired by all the fun finds – the second you see it, you need it! We aspire to create that feeling with the breadth of the narrative-driven merchandise edit we are bringing to life with the launch of STORY at Macy’s across the country,” added Shechtman. For Color STORY, Macy’s brings its ‘feed’ to life via a bright journey expressed through a curated assortment of merchandise for men, women, kids and the home. More than 70 small businesses featuring more than 400 products come together to make the experience a gifting destination. From the national in-store debut of Primary, an online kidswear brand, to gourmet chocolate bars in unique flavors like coffee & doughnuts from LA-based chocolatiers Compartes – there is truly something for everyone. To further bring color authority to the conversation through color-inspired events and experiences, MAC Cosmetics, Crayola® and Levi’s® Kids contribute an exciting lineup of events and integrated merchandise moments. MAC Cosmetics joins Color STORY with an experience that, up until now, has only been available at its professional stores. The experience features MAC’s custom-build service, a “Make Your Own” palette station, available at 30 select STORY at Macy’s locations. Color-curious guests will also have the opportunity to take beauty classes on-site from expert makeup artists, mastering spring’s must-have looks from smokey eyes to festival-ready unicorn beauty. “We are excited about MAC’s partnership with STORY. Creativity and innovation are an integral part of MAC’s DNA and will play well with STORY’s colorful new concept at Macy’s,” said Chris Good, president, MAC Cosmetics, North America. Crayola will have hands-on workshops featuring its Create it Yourself (C.I.Y.) Network of creative and clever crafting videos. This series inspires inventive uses for Crayola products through hands-on workshops and classes like Melted Crayon Canvas artwork to creating custom patches to adorn classic Levi’s Kid’s Denim jackets and tees with Crayola fabric markers. “At Crayola, we inspire creativity through color and innovative play experiences. We are excited to partner with STORY at Macy’s to celebrate their new opening and debut select pieces from the Macy’s back to school exclusive Levi’s x Crayola collaboration,” says Smith Holland, president and chief executive officer, Crayola LLC. The colorful fun will also appeal to big kids through events like P.S. We Love Hue: CRAYOLIGRAPHY hand lettering workshops featuring Crayola Take Note! markers and pens with crafting influencers such as @AllWriteByMe, @theblondescribe and @angeliqueink, at select locations. Levi's Kids, manufactured and distributed by Haddad Brands, will preview a selection of pieces from its exclusive Levi’s x Crayola collaboration debuting at Macy’s for back-to-school. A few select pieces from the collaboration will be available before the full line officially launches mid-June at select Macy’s stores nationwide. “We have a successful history with Macy’s and, when we heard that STORY was launching, we knew it was the right channel to build buzz around our future collaboration,” explained Sam Haddad, principal, Haddad Brands. STORY at Macy’s averages 1,500 square feet, cumulatively representing more than 55,000 square feet of main-floor retail space across all 36 stores. Herald Square serves as the flagship location, where STORY at Macy’s covers more than 7,500 square feet of continuous retail space on the main floor and mezzanine levels. The expanded space showcases a broader range of partners and interactive experiences. New York designer David Stark expands his vision into a colorful circus, complete with faux fur columns and endless Instagram-able moments. The in-store design is animated with a giant interactive Lite-Brite® experience produced by LiteZilla and an illuminated rainbow tunnel featuring colorful Tetra Contour technology from Current by GE. And further building on STORY at Macy’s commitment to supporting small businesses, the Herald Square flagship features an expanded range of independent brands, such as Brooklyn-based handbag customization kit ‘I Made that Bag,’ Fun Socks and colorful glasses from Izipizi. Longtime STORY friend and collaborator, NY-based artist Georgia Elrod lent her creativity to bring the experience full circle with an original mural in the expanded event space – complete with an LED ping pong table. Opening today and running through Wednesday, June 26, Color STORY will engage customers through its calendar of events and classes, focused on self-expression and creativity. For more information on STORY at Macy’s locations and for a listing of events by store, please visit macys.com/STORY. For media images please visit https://macysinc.com/news-media/media-assets and select STORY. Macy’s Metro Center – Washington, D.C.
STORY is a new retail concept that changes every few months to bring a new narrative experience to life through curated merchandise and event programming. The ever-changing experience began in 2010 in New York City, where STORY operated as an independent small business for seven years and pioneered a retail as media business model that changed every eight-weeks to open a new theme while engaging brands as sponsors for each themed STORY. Macy’s acquired STORY in 2018 and its founder Rachel Shechtman now serves as Macy’s brand experience officer. STORY launches today as STORY at Macy’s. Visit macys.com/STORY for more information. Macy's is America’s store for life. The largest retail brand of Macy's, Inc. (NYSE:M) delivers quality fashion at affordable prices to customers at approximately 640 locations in 43 states, the District of Columbia, Puerto Rico, and Guam, as well as to customers in more than 100 international destinations through leading e-commerce site macys.com. Macy's inspires fashion exploration and discovery through the most desired family of exclusive brands for her, for him, for the home, and via our dynamic mobile and social platforms. We know the power of celebration, demonstrated through decades of memorable experiences created during Macy's 4th of July Fireworks® and Macy's Thanksgiving Day Parade®, as well as spectacular fashion shows, culinary events, flower shows, and celebrity appearances. Macy's flagship stores – including New York City’s Herald Square – are internationally renowned and preeminent destinations for tourists. With the collective support of our customers and employees, Macy's builds community and helps make a difference in every market we serve, supporting local and national charities by giving nearly $50 million each year, plus 146,000 hours of volunteer service. For more than 160 years, Macy’s has, and continues to, make life shine brighter for our customers, colleagues, and communities.